This could certainly work for a birthday, but I've pegged it as a wedding card for the shop. Roses are so romantic, aren't they? I sprinkled some clear glitter on mine. 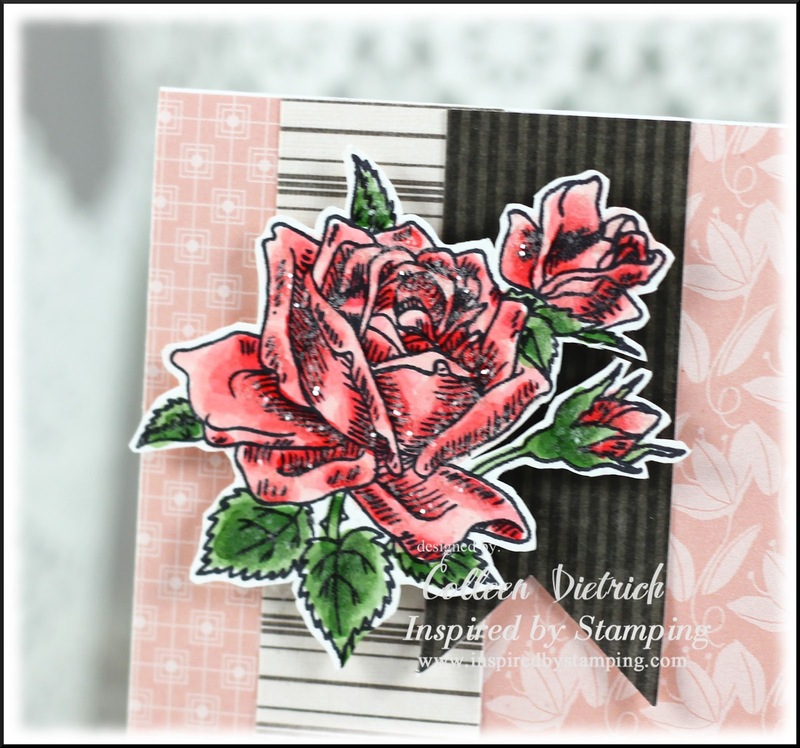 Both the roses and the sentiment are from Inspired By Stamping, and papers are a mix of K & Co. plus Stampin' Up!. My kids have been off from school for a total of 12 days for this Christmas break, and it's been so nice. We visited with family many days, played with our new toys (all of us! ), saw two movies ("Hunger Games / Catching Fire" and "The Hobbit 2"), and took a trip to New York City for the day. That was very exciting! We saw the Rockettes at Radio City Music Hall -- their Christmas show is unbeatable -- and I marveled at the long, long line for the ladies' room. Ha ha. There was an employee in there directing traffic to the various stalls! Unreal. We were in the mezzanine section, pretty far from the stage. Still, we could see pretty well. Close up of a window at Lord & Taylor. Me, in front of M & J Trimming on 6th Avenue. Oh, what a mecca for ribbon and lace lovers! These are all rhinestone trims and closures. Gorgeous, gorgeous. This is where I spent the most time in the store: the lace area. That M & J Trimming is something else. The ribbon reels go all the way up to the high ceiling, in orderly fashion. Goosebumps, I tell ya! They had a button room, too, and everything was grouped according to material: leather trim, burlap/jute/natural fibers, satins, velvets, embroidered, rosettes, and on and on. They had a fabulous selection of sequins, too, and some came home with me. There are trims that probably grace some of the finest wedding and celebrity attire out there. Mmm, mmm, mmm. I would've spent so much longer there, but you should have seen the faces of my family. They said, "Can we get outta here now??" So I left with some lace, sequins, and skinny gingham ribbons. I will hoard them for a good long while. We also went to the observation deck of the Empire State Building. The line was SO. LONG. Even though we had tickets already, we'd have had to wait in a 2-3 hour line to get in. My hubby upgraded the tickets then and there, so we had express passes. It's the only way to do it on a crowded day like that. I highly recommend that. It helps on the way down, too, otherwise we'd have had to wait just to get back to street level! I have no idea which building this is. It's not the Empire State Building. It just looked cool. This IS in the Empire State Building. Even the elevator is amazing-looking. Wishing you all a peaceful, healthy and prosperous 2014! What a trip! That's somewhere I've never been. The sights look amazing, especially those store fronts. And I would be so overwhelmed in any kind of craft store there! Thanks for sharing, not only your beautiful card, but your awesome trip as well. 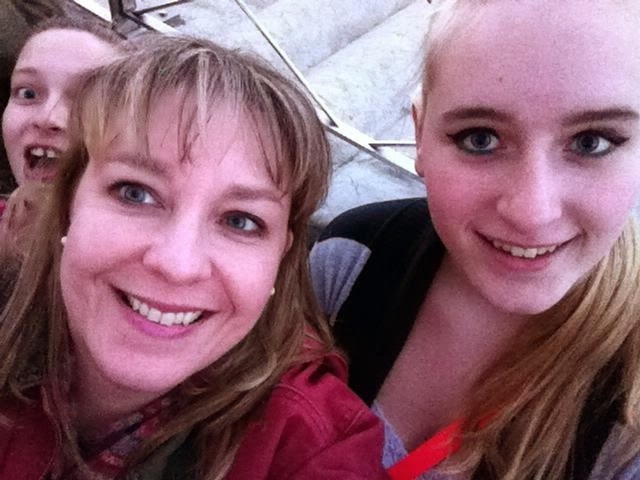 Looks like you had a wonderful time with your family Colleen! :) Great pictures! Your card is SO beautiful! The coloring on roses is fab! Wow! What great photos, Colleen!!! Thank you for sharing them. It looks like you and your family had a wonderful time. I was lusting over those trimming photos too. I had to wipe the drool off my keyboard. Oh, and last but not least, a very, very pretty card as well. Happy New Year to you and yours!!! *sigh* I haven't been home in sooooooo long ... thanks for the photos ... makes my heart happy!!! I loveeeeeee your card! LOVING the flower!! Happy New Year!!! What a fabulous and fun trip for the holidays! I have not been since right before 9 - 11. We went up in the Empire State Building and took pictures of the World Trade Center. A few days later the world changed forever. Colleen your card is just sooo pretty. Perfect. oh this is a beautiful card and it looks like you have been enjoying the winter break! Happy New Year!!! Wow Colleen! Looks like you had a fabulous trip!! That Christmas tree in the lobby is awesome! I feel like I've seen New York-you captured some great photos. I pray you & your family have a Happy new Year!! HAPPY NEW YEAR Colleen!! Your NYC trip looks like fun. and the ribbon store..gasp...I need to see that place!!! Gorgeous card my friend, really gorgeous! Happy New Year!!! What a gorgeous card!!! Love the glitter, such a beautiful touch!! Great pictures of your trip to NYC!!! Looks like you all had a blast!!! Beautiful family too!! 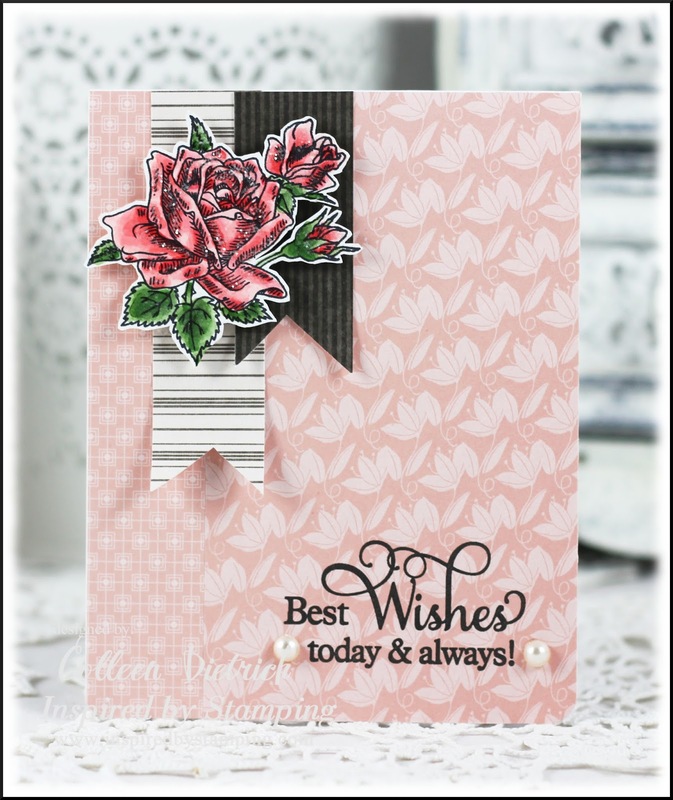 A very pretty card with lovely roses and perfect sentiment! Looks like you had lots of fun in NYC! I would love to get there some day! And, I would probably faint seeing all those luscious trims and ribbons in the M&J store...swoon...how fun! Wonderful photos of you and family! Take care, hugs! What an wonderful card. Looks so pretty. And I LOVED seeing your photos of your trip. Looks like you had a blast..